Shotgun Funfun is a side-scrolling shooter in which you navigate through level after level, killing Demon Zombies. 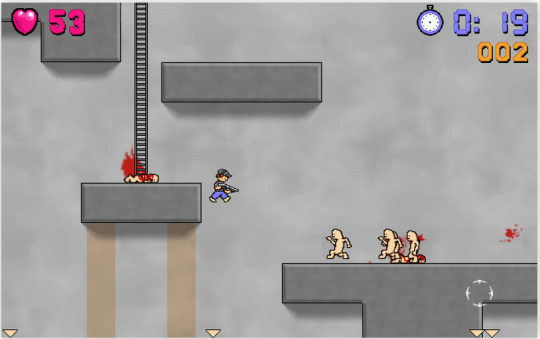 The Shotgun Funfun graphics are reminiscent of videogames from the '80s, with platforms and ladders, and a side-scrolling action. You have unlimited shotgun shells and you'll need them. The publishers claim there are 100,000 Demon Zombies in the game, but we lost count very quickly. Unlike in games from the '80s, the Demon Zombies spew animated blood and guts when you shoot them. There's a timer running, too, so you have only limited time in which to accomplish your goals. In the end, your score is calculated based on kills per second. Although the game may sound derivative and not too thrilling, you'll be pleasantly surprised. The graphics actually work in Shotgun Funfun, keeping the screen simple and letting you focus on the action of shooting Demon Zombies. There's a curious satisfaction to doing so, too. We played it, put it aside, and went back to it over and over again, always trying to do better. And that's what a good game does to you. Explore lost worlds, retrieve ancient artifacts and unlock the past.